scrapolous mom of three: Model in the Future? Today we had the best grown-up girl bonding time. Because you saw me looking at some Mango models, you pleaded that I dress you up, apply make up on and take pictures of you. Oh well, Dad is not around so why not? So there, you had become the most adorable model and of course with mommy as your wanna-be photographer. I was amazed at how you projected on the camera without me giving instructions of how you should pose. Maybe, in the future, you will be a model and when that day comes, Mommy will be the most proud and happy mom in the whole world. I love you Erin Girl, my mini-me. 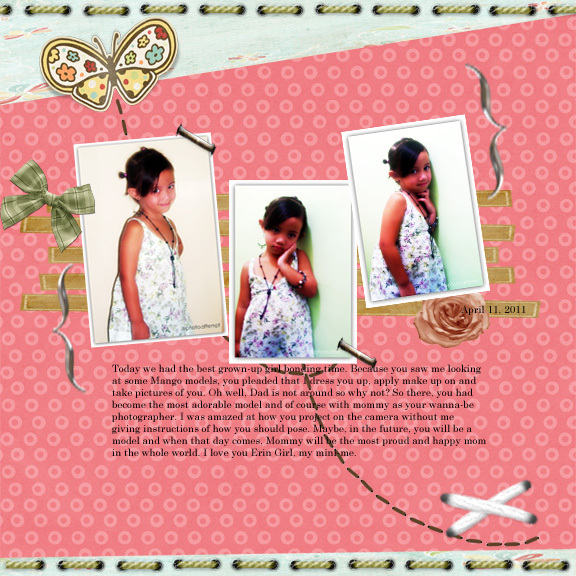 I'm a mom of three who found solace through Digital Scrapbooking. Imparting what I love most, which is to create and design photos that tells a lot even without words. My journey to blogging all started here.